Like Merchant Ships: Staying strong! Q: Why worry about leaving so much empty space in a closet? I guess I don't get the connection between storage and frugal living and why you have to get rid of so much stuff? A: Because if I let myself, I could completely redecorate my house--and a couple of my friends' houses--in a matter of weeks. And have a ball doing it frugally. Because there is great stuff out there, cheap, doesn't mean I have to have it. 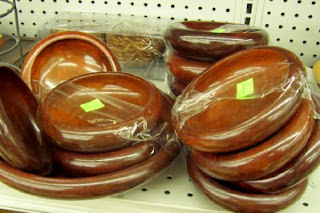 Because empty space can be harder to find than another set of handmade salad bowls. And why blog about it so much? Because I need the constant reminder. Buy what I need, use what I have, give creatively and often. Your final note: Because I need the constant reminder. Buy what I need, use what I have, give creatively and often. Is perfect for me. I NEED this note myself. Meredith - I have "lurked" at your blog for a while. I just wanted to take a moment to tell you how uplifting and encouraging I find the thoughts and ideas that you share. I feel like I was lead to your blog as I have been struggling with creating a peaceful atmosphere within my home, as well as achieving some organization, all the well staying within financial reason. Your blog is truly a testament of your relationship with God and I just appreciate your sharing so much! I too have to keep myself in check with what I could do, for me again & again it is sticking to my themes (ie. green & gold stars for Christmas) or color schemes to resist the temptation. Sometimes I find just putting into my cart for a while then putting it back (in the right place) satifies my "gatherer" instinct. as to why blog about it...you are making the world a better place by sharing your experience, knowledge and creativity. You are inspiring others and giving them tools to create the homes and lives they want to have. Yes-- yes!!!! I can only add that for me, it is all tied to contentment-- that no matter how inexpensive the items, no matter the creative possibilities or that we stayed within the budget, at some point you have to decide how much is enough. I have seen in myself that it is just as easy to hoard, to be as stuff-hungry, on a little budget as on a big one. And as your skill in frugality grows, it gets tougher, because you are better able to still buy within budget. To say "enough," to say "I don't need it," is a position of power. I need the constant reminder. In fact, lest I sound like I have this "down," I am currently taking a break from Goodwill, from clearance racks, from stores other than the grocery altogether, to give myself a "stuff break." For right now, it is easier to not put myself in those situations. I'm sure I am missing out on some great deals. But others will be there when I need them. Thanks so much Meredith, for helping us remember. Love that last sentence--thanks for the inspiration! I was filling out a "get-to-know-you" form for a women's ministry at church. Under the question "What do you collect?" (translated means: clutter coming my way -- little quote calendars, candles, mugs, tea bags ) I answered: EMPTY SPACE. It took me a long time to realize that when I store something, the empty space around that item is just as valuable as the item itself. Empty space leaves room for the eye to see, the mind to rest. Empty space makes retrieval and return to storage stress-free. But it takes discipline, which may take years to develop. God is so patient with us. It's all a matter of stewardship isn't it? Considering how our time is best used, how our money (even if it is just pennies) is best spent -- what is most glorifying to God. Surely it is better stewardship and more pleasing to God and others to share our frugal "wealth" rather than let things accumulate in closets only rarely, if ever, to be used. 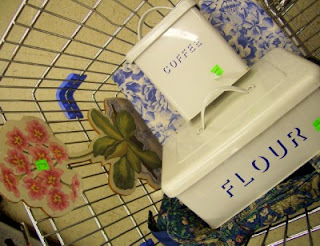 I agree with you and yet, I want those pretty coffee and flour tins. I don't find as many good deals as you but it's still hard for me to resist filling in every nook and cranny with my bargain finds. It's hard to remember that just like quietness can be bliss, empty space can do the same for your mind and soul. Only having things you truly love around you is easy to say, but never so easy to do. However, I find if I only have things I love (like dishes), then I can have less of them and be just as satisfied. More doesn't always mean better, and thank you for reminding us of that. Yes, my heart leapt at those tins and the blue/white under it. I really enjoy your blog, Meredith! So, did you buy those tins? Where are they now? No, I didn't buy them. They were priced too high at $3. I left everything on the shelves and only came home with a 50 cent library bound copy of The Chanticleer and The Fox. THAT is why I love your blog so much! Your philosophy and your sometimes wavering commitment to it is so inspirational! You make me laugh and you make me think.....and you make me clean my house. Did you ever imagine you would have a FAN that lives in the frozen Canadian prairies? Keep it up....you my friend are why favorite lists were invented. I would love to ask you where you were browsing such fun & frugal stuff but going from a house to an apartment (and still paying for both) as made me decide I will not gather any more "stuff" in our lives until we have a bigger space. We already have more than we need in our little space (and scarily have to add stuff for another baby this summer!). Your last remark sums it up! Well put, Meredith! I am loving your latest Frugal Thinking series. I have needed it! And the little discussion on storage the other day got me thinking. I just posted and linked to your series. Hope you don't mind. It might generate all of 3 more readers for you. LOL. I like to point out stuff stored and unused is money stored and unused. Would you take $50 and keep it in the closet, when it could be earning interest in savings or ministering to others? And Meredith if you ever do decide to redecorate a friends house, you are more than welcome here in Washington. I feel as if I have just sat down and had lunch with a lovely group of women friends. Everyone's comments and your post, Meredith, are thought provoking in a very positive, encouraging way. Just on the way to work this morning I was thinking about how I like to blog about stuff, items, things in my home . . . it is fun but I even noticed myself at an antique store the other day thinking if I bought such and such, how cute it would look on my blog! On my blog??? What about in my home? Oh dear! I decided that I want my blog to be more about people than things. I want my LIFE to be more about people than things! I will still post about things on occasion because it can be fun and helpful, etc. but I just want to keep myself in check and make sure I am blogging about people more! From the philisophical to the practical: Usually when I clean out I ask myself Flylady's three questions, "do I use it? ", "do I love it? ", "does it make me smile?" I think these are all very good questions but lately I've been asking myself one more. "Will I miss it?" If I get rid of it will I ever think of it again? If the answer is no I have found it is SO much easier to pitch. Also, when I am in a store I try to visualize the "thing" that has caught my eye in my home. What would I use it for, where will it "live"? This often helps me. I remember in college a wonderful Christian mentoring woman say, "You don't always have to own something to enjoy it." How true! As I've been reading about all your great bargains (I've been slowly catching up on LMS history through the archives) I've been itching for spring for some garage sales to try my luck! But I felt uneasy about it too because I can always find SOMEthing to justify buying. So I REALLY appreciate your timely reminder in this post! Over the past few years, I've been slowly making the change of USING my pretty things instead of just storing them. For example, we use cloth napkins all the time. And I only keep tablecloths that I use. And we have one set of Dansk china that is simple but lovely to look at (and sturdy, thank goodness). Thanks again for sharing your wisdom with your readers! Many times I've hovered over an item -- seeing what a great bargain it was -- wanting to pick it up because someday it might come in handy. My solution has been to Thank God that it is there and for the wonderful blessing it will be FOR SOMEONE ELSE. Keep up the good work, you are an inspiration to me. All great points. 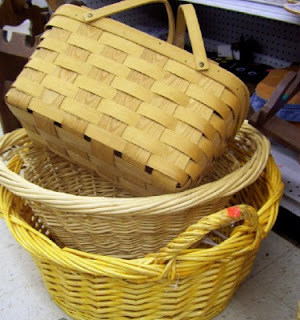 I struggle with the desire to buy a good deal so much that I've learned for myself I can not explore things like Craig's List and I don't spend much time in Thrift Stores. I go a few times a year with specific lists (clothes for daughter, wreath for front door, etc). As for giving stuff away, it can become so addicting! I agree with many of your points and find that blogging about things like this helps on those bad days. Those days when either you feel like you can't do it, or you just plain don't want to do it! "Empty space leaves room for the eye to see, the mind to rest." One child of mine has been diagnosed with a learning disability. I've noticed that each book I have read on his disability stresses keeping his room and environment free from clutter. It made some sense to me, it would help him keep organized and so on. Now I believe it is more than that, I agree that some empty space does promote peace and quiet internally. Sometimes we may not invest much money in our bargains but we wind up investing so much of our time, our energy and ourselves maintaining what we bring home. Less really is more. Another great post, Meredith. Thanks for sharing your wisdom. I appreciate your insights. Meredith, you have inspired me to start my own frugal blog. It's pretty simple, but if you ever want to check it out at http://ivyleaguehomemaker.blogspot.com/. I pretty much started it for the same reason you said you blog about all the things you could buy but don't--to remind yourself. I read your blog all the time also to remind myself I'm not alone. It's nice to know there are other people out there who are trying to live on less and have fun doing it. Our styles may be different (You are so much more elegant than I am)but I am so happy for you when I read how you pull off such great things with such little expense. Thanks for the inspiration!